Do I have a ‘bad’ dog? Despite your best efforts, something’s gone wrong. Your special friend’s adjustment to his new environment has hit a bump in the road. Or, an old friend is suddenly behaving in new, unwelcome ways. What to do? 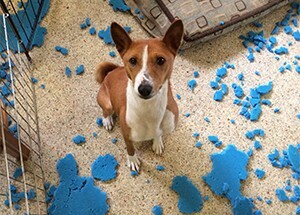 The potential causes of dysfunctional behavior are many—and frequently particular to each dog. As a result, identifying drivers of behavioral change starts with scrutiny of any changes in routine, diet, exercise, social interaction, health, and the aging process generally. In other words, causes of undesirable behavioral can be simple, and easily addressed. But they also can be very, very complex and require professional help. Here’s what’s most important: DON’T DELAY. Misbehavior only gets worse with time. And behavior that is merely annoying today can, absent intervention, become downright ugly—even dangerous—down the road. If you find you are having issues you can’t fix, we encourage you to seek help from a CERTIFIED professional. Links below can help you locate the proper professional (and understand what the alphabet soup after a name means). Assume nothing. Make sure you ask potential behaviorists and trainers about their philosophy and methods. Find one who says they use positive reinforcement rather than forceful or punishing methods. Once you are comfortable with what you are hearing, watch her work with other dogs to see if her style and personality will work with you and your dogs. Are the interiors of your doors and window sills taking a beating? Is your carpet shredded and furniture ‘remodeled’? 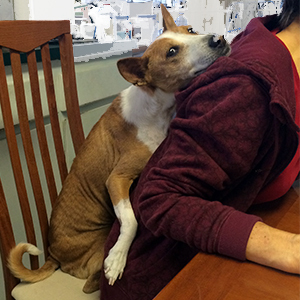 Your Basenji may have separation anxiety. With the right training and help, your besty can become more comfortable and confident while home alone. “Another accident!? 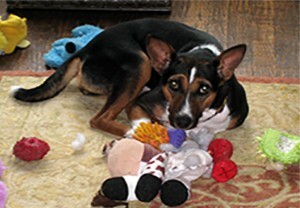 I was told this dog was housetrained…” Who—or what—is to blame? Did you provide the opportunity for the dog to eliminate outside? Or is something wrong with your besty? A growl here, a snap there… Is this OK? 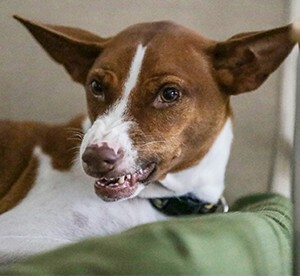 Should I expect and accept this behavior from my new Basenji? Basenjis love rough and tumble. But rough play can escalate into fights. And this is but one of many conflict triggers. 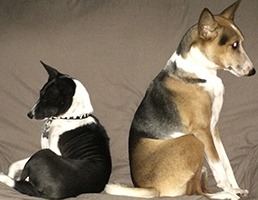 Read on to learn more about our experience preventing and stopping dog conflict. What is it? Good thing or bad? This behavior is commonly referred to as being ‘protective’ or ‘territorial’. It’s neither. A ‘resource’ can be just about anything; food, a person, a place or space, a toy or other object. Read more for recommendations to manage this behavior. 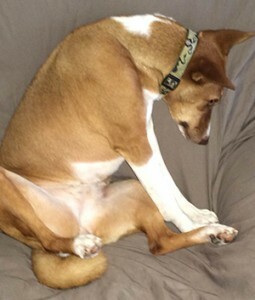 Is your new Basenji shy? Does she skulk around, tail tucked between her legs, looking for a hiding place? Or is she displaying ‘aggressive’ behavior? What’s the difference between timid and fearful?